Chelsea boss Maurizio Sarri has revealed what was said between him and Jurgen Klopp during their recent encounter with Liverpool at Stamford Bridge. The two sides squared off on September 29 as they played out an entertaining 1-1 draw in the capital, with both teams remaining locked level on points at the top of the Premier League after eight games along with Man City. Both Chelsea and Liverpool have been widely praised for their style of football under their respective coaches, and although they are direct rivals this season as they hope to secure silverware, Sarri has revealed that he clearly has a great relationship with Klopp. 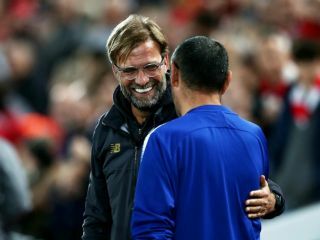 So much so, that the pair even had time to share a joke with each other during the encounter last month, with Sarri revealing Klopp was certainly enjoying the spectacle that was playing out before them. While intense rivalries between teams and coaches are always entertaining too, this level of sportsmanship when all the drama and entertainment is being delivered on the pitch is also great to hear about as there is an obvious mutual respect between the two. Both Sarri and Klopp will continue to be driven by the desire to win games and trophies though, and it remains to be seen who ultimately has the last laugh at the end of the season as they try to dethrone Pep Guardiola and Man City this season.